In short, lots of things. When a magnet is magnetised to saturation, substantially all of the 'magnetic domains' in the magnet become aligned. If nothing else happens, they'll stay more or less like that for a very long time. However, anything that disturbs the alignment of the magnetic domains or releases them from their alignment will reduce the strength of the magnet. Once the strength has been reduced, it usually isn't regained unless the magnet is remagnetised. How easily the alignment is disturbed depends on many things, including the material from which the magnet is made and its shape. One thing that permanent magnets like is an easy external path for the magnetic flux between the two poles of the magnet. Iron and steel provide an easy path. Air and aluminium make it far more difficult for the magnet. When the magnet of a magneto is being magnetised in situ, the steel or iron of the magnetising machine provides an easy route for the magnetic flux. However, once the magnet is removed from the magnetising machine, the flux path is more difficult, and the strength of the magnet reduces. How much depends on the type of magnetising machine used (external or internal), and if an external machine it can depend on whether the armature is in the magneto body, and if so it can depend on the rotational position of the armature. 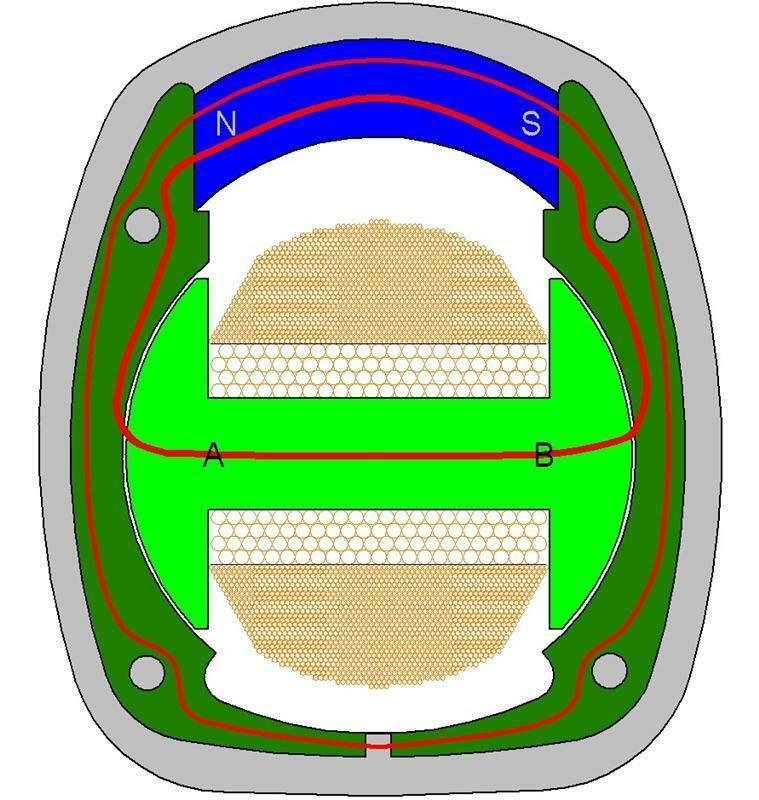 Once the magneto is assembled, and the armature is rotated, the flux path varies between a relatively easy path as shown in Fig. 1 in which the armature core is aligned with the poles, and a relatively difficult path in which the armature is 90 degrees out of alignment (Fig. 2). If the path of Fig. 2 is the most difficult path the magnet has seen since it was magnetised, then that reduces the strength of the magnet some more. Another thing that a permanent magnet dislikes is an opposing external magnetic field. 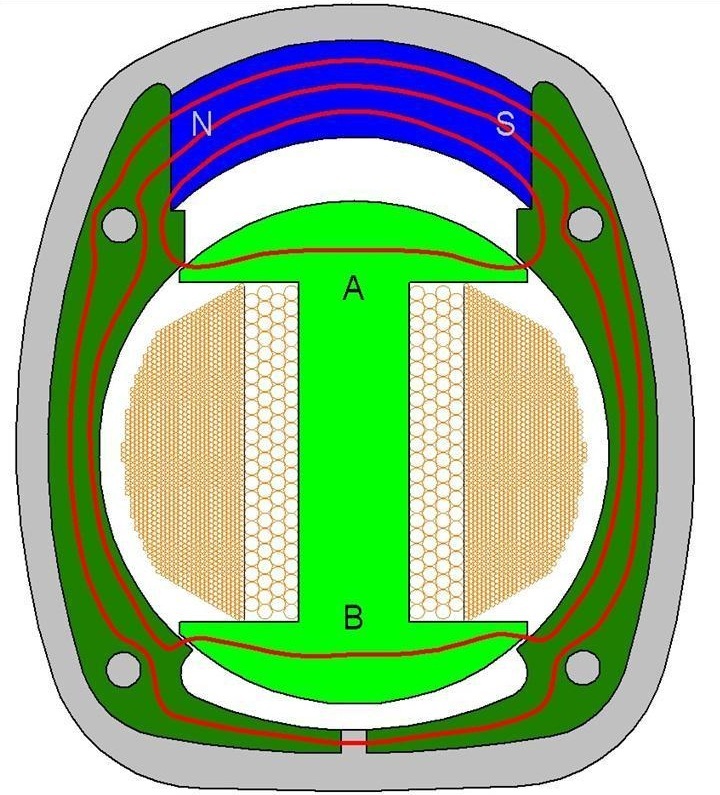 When the magneto is operating, the electrical currents in the windings produce a magnetic flux in the armature core opposing the flux caused by the magnet, and the opposing flux gets passed back to the magnet. Our tests have shown that with a Lucas K-series magneto, the magnet's strength is knocked down as a result of this opposing magnetic field to a level less than when the magneto body is initially removed from an internal remagnetising machine. The following table contains the results of some tests we carried out. In each case, the magneto was run (or not run) under the conditions in the left-hand column for however many minutes. The armature was then temporarily removed, and the magnetic flux density at the centre of the cavity in the magneto body was measured with a gaussmeter before replacing the armature and continuing with the test for however many more minutes. As can be seen the majority of the observed reduction in magnet strength happened within the first minute of the cause arising. Subsequent reductions were small by comparison. We haven't yet conducted any long-term tests under controlled conditions to see what happens over periods of days or months or more. 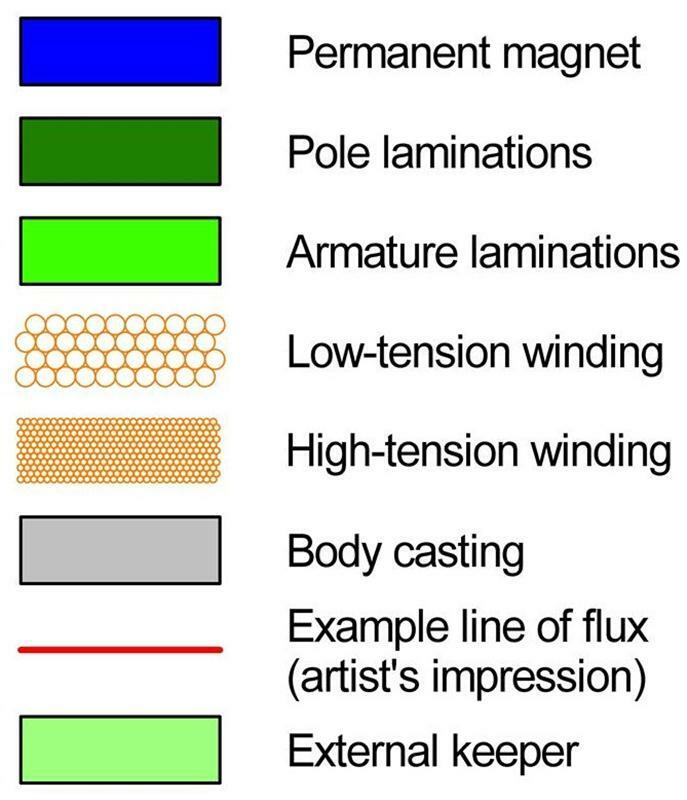 Other things which can cause reduction of magnet strength are temperature and vibration, and we suspect that when (a) fluctuations in the magnetic flux path, (b) an adverse external magnetic field, (c) elevated temperature and (d) vibration are combined, they perhaps have a synergistic effect. If there is anybody who can educate us on that, we'd be delighted to hear from you. Lastly, permanent magnets do lose some strength with time, but we understand that the effect of time alone is slight. However, when all of these effects are combined, they cause the magneto's magnet to lose a significant amount of strength. The Lucas K-series bodies that come to us for remagnetisation typically produce a reading of 150 to 180 gauss at the centre of the mag body cavity. After remagnetisation and removal from the remagnetising machine, the strength is typically increased to about 200 to 220 gauss, but then drops by several gauss immediately the magneto is put to hard use.